My specialty is helping horse lovers around the world do amazing things, such as escape from the rat race, organise their lives to find more time to do the things that make them truly happy. They’re able to release anxieties and frustrations while achieving a purposeful life centered around family, career, and their love of horses – allowing them more positivity, glowing confidence, fulfilment, and optimism for the future. For me, horses have always been an important part of my life. I love nothing more than the company of a horse. They have so much to teach you, if you listen carefully. Horses for me are far more than a hobby – it’s a lifestyle and I cannot imagine being without them. Horses bring out my confidence and have given me many wonderful memories. They are part of who I am. But I was not one of those kids who had ponies from an early age. My independent streak was always present. As soon as I was old enough (about 10), I worked at a small riding school, in all weather, 365 days of the year, in return for free rides. Then at 19 I went to agricultural college to study horses. Many of my fellow students had owned and ridden their own ponies since they were three. But I was determined not to let my lack of experience hold me back, so I took the opportunity to learn as much as I could. 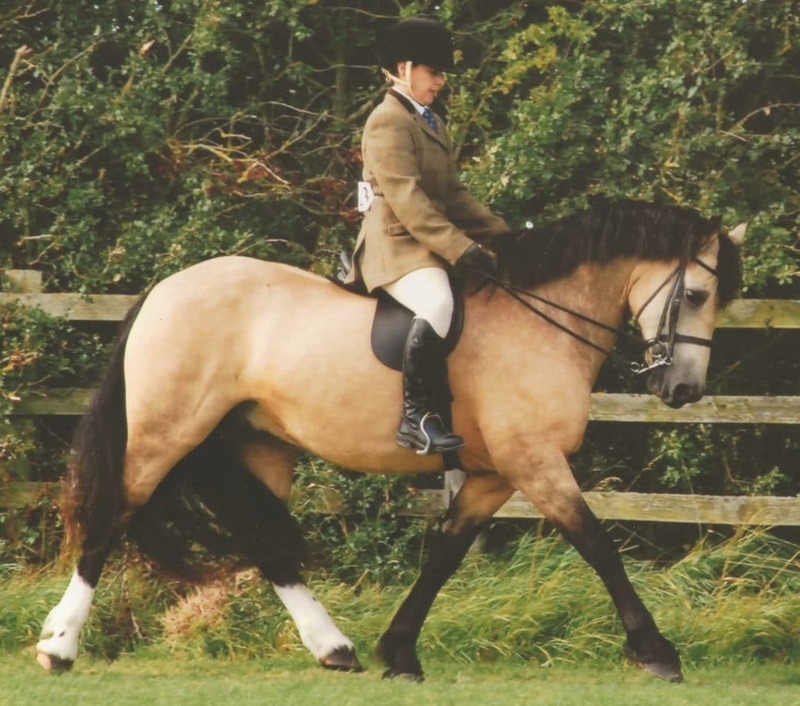 I rode lots of different horses from native ponies to ex-race horses, I learnt dressage, show jumping, equitation, equine anatomy, and physiology, teaching and, best of all, true independence on a horse. For many years I worked as groom. I was always extremely fit and had a fabulous sun tan in the summer. I rode lots of horses, and being quite small and in those days very light weight, I got to ride children’s ponies, youngsters, point to pointers. I had to ride horses that were difficult and needed a lot of understanding and patience. The ones that no one else wanted to ride due to near-death experiences… you could call it character building! I bought my first horse when I was 31 with my own money (and a little help from the passing of my Grandma). After so many years of looking after other peoples horses, I was the proud owner of Max, a very handsome Welsh Section D.
So what happened in my life that gave me confidence with horses and riding, and how has it changed me? I have not always been a confident rider – overcoming my confidence issues has made me a significantly more confident person in general. Horses have often made me test my ‘confidence muscle.’ I have lived through many tricky rides, naughty horses in the show ring, and a fair few ‘hair-em scare-em’ rides. I survived to tell the tale and I am a stronger person because of it. Along the way I have often noticed how other people struggle with their nerves when it comes to horses and riding that stop them from enjoying horses. Often it’s experienced riders who have, for whatever reason, lost their confidence, or sometimes its people who have come to horses later in life but found that it’s not as easy as it looks. These are such common problems and cannot be dealt with simply by saying, “Oh pull yourself together!” Because the problem lies at a deeper level than most people realise. Many feel embarrassed about it or just wish there was some way to train themselves to be more confident. We horsey people spend a lot of money in pursuit of our horses, not to mention time and energy, blood, sweat, and tears. So I think you will agree… it’s worthwhile doing something about the things that trouble you, get in the way of your success, keep you awake at night, and cause unnecessary stress. Riding horses helped my confidence, from a shy introvert to a confident woman ready to take on anything that life throws at me… because of the way I faced those issues. I began by helping friends and progressed to offering my coaching services professionally. 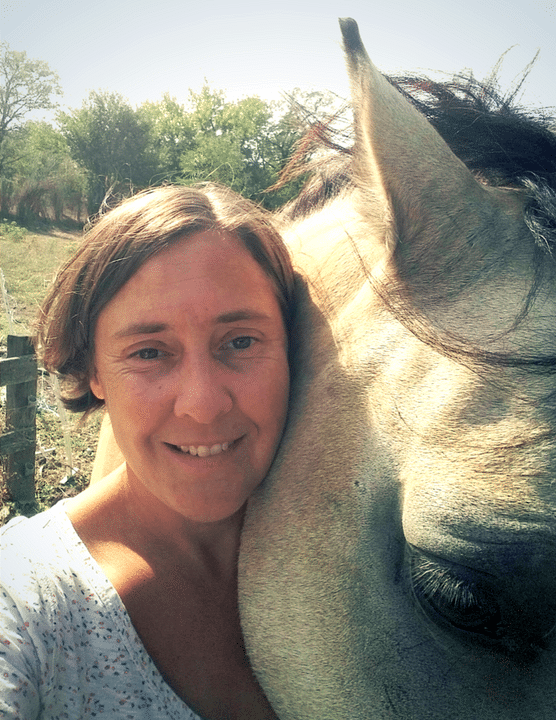 I started The Confident Rider Project because I felt a need to help other riders like myself get more from their horses and release those limitations that are keeping them stuck, not just with horses, but with all aspects of life. I moved countries in search of a better life for me and my family (my two daughters and partner). Four years ago we decided to move to Bulgaria… we took a van load of our belongings, sold or gave away the rest, and bought a house with land. Having our own small holding has been a lifelong dream, and we did it! Part of the reason for this move was to have my horses at home – another lifelong dream. I have inspired many clients to ride their horses and feel happy about it. One lady posted a video on Facebook of her laughing and giggling whilst cantering along through the woods. 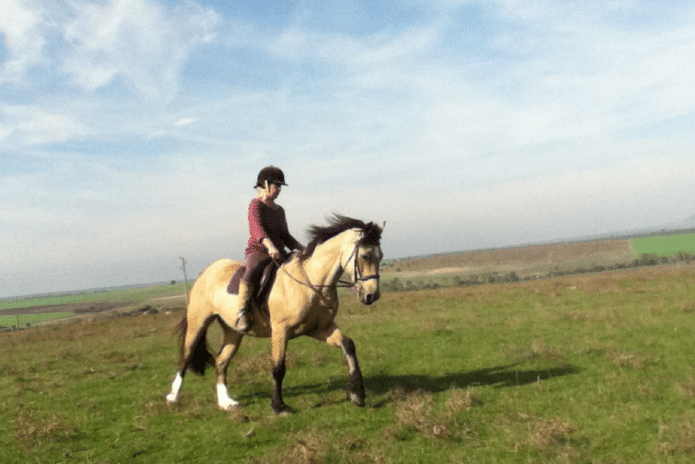 Such an amazing achievement after she had not ridden for six months. My recent client has had a major up-level in her life after shifting her limiting beliefs and realising that she was capable of far more than she ever thought possible. She had big dreams and ambitions, such as spending more time with her horses and keeping them at home. She is now well on her way to building her barn as she imagined it would be and her horses will have a cosy new home by the time next winter falls. I use my horsey experience and powerful coaching techniques and my ‘glass half full’ attitude to life to help horse lovers all over the world to discover and create their own confidence and courage – with the consequences of lasting positive change in their lives. Horses have taken me through my highest highs and lowest lows in life. It’s the one thing that I have consistently done up to this day. Riding and being with horses is an unbroken passion that never gets less for me. Visit my website at The Confident Rider Project. My aim is to help people live life on their terms and provide resources and solutions for all aspects of life for horse lovers. Kristin is a digital marketing expert and voiceover talent in Sacramento, California, with a life-long passion for horses. In her spare time she's active with her daughter and son. See Kristin's marketing agency and LinkedIn profile. Want to be a Guest Writer for ilovehorses.net? The Official ilovehorses.net Word Cloud!